Kevin Swindell is surrounded by folks from Friendly Chevrolet of Springfield. 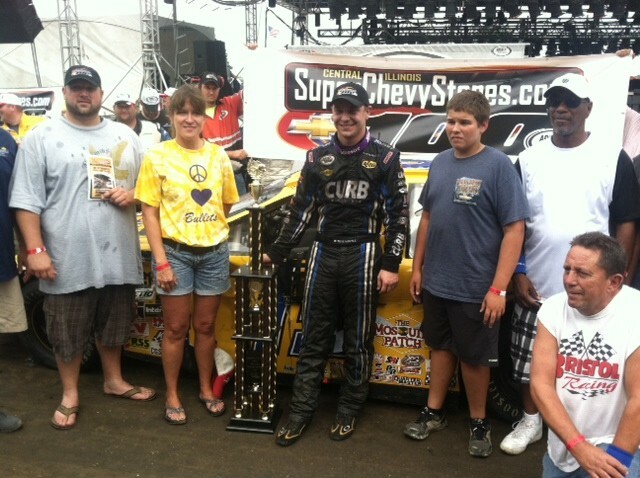 Swindell won the SuperChevyStores.com 100. As of 5 p.m. Tuesday, Kevin Swindell wasn’t sure what he was doing this weekend, but he didn’t plan on racing. That changed when Venturini Motorsports’ Billy Venturini called and offered him a chance to drive the No. 15 Zaxby’s Toyota on the one-mile dirt track in Springfield, Illinois. Swindell accepted the offer early Wednesday morning and took the team to victory lane Sunday afternoon. It wasn’t easy – and Swindell’s beat-up race car after the race was proof. He hit a wall during practice, and had a few hits on the track during the race. But, the Venturini team fixed it at every chance. Swindell led 21 laps, taking the lead for good on lap 89 of the 100-mile, 100-lap Central Illinois SuperChevyStores.com 100. He held off ARCA Racing Series point leader Mason Mitchell, who got stronger at the end of the race, zipping from seventh to second over the final dozen laps. In doing so, he maintained his series point lead over Grant Enfinger, who led the most laps and finished third. Enfinger was running his first dirt track race since 2011 and was pleased with his finish. He led 33 laps, compared to 31 for Mitchell. The race took 1 hour and 17 minutes to complete and was delayed by nearly an hour as crews from the fairgrounds and Track Enterprises – the race promoter – worked on prepping the track after heavy rains hit the Springfield area Saturday. When qualifying was rained out, it forced the fastest car in practice – the No. 16 of Kelly Kovski – to start 27th. Within four laps the Springfield, Ill. native was in the top 10 and he took the lead momentarily in fact. Shane Cockrum was another of the fast cars that started near the back. He came from 29th to ninth. The No. 44 Ansell-Menards Toyota of Frank Kimmel finished fourth with his nephew Will Kimmel fifth in the No. 69 Messina’s Ford. Kovski was sixth in the Billingsley Towing-Fire & Ale-Schluckbier Chevrolet, Justin Boston seventh in the ZLOOP Toyota, Kenny Schrader eighth in the Federated Auto Parts Chevrolet and SCOTT Rookie Austin Wayne Self in the AM Technical Solutions Dodge was 10th and the highest finishing rookie of the race. James Swanson finished a career best-14th in the No. 0 Wayne Peterson Racing Dodge, despite pitting only once for fuel only. He led four laps, the first four laps he’s led of his career. The race had six cautions for 32 laps. The ARCA Racing Series goes next to Madison (Wisc.) International Speedway for the Herr’s Live Life With Flavor 200. The race will be live on CBS Sports Network at 2 p.m. CT, Sunday, August 24. Kevin Swindell (Germantown, TN) Toyota, 2. Mason Mitchell (West Des Moines, Iowa) Ford, 3. Grant Enfinger (Fairhope, AL) Chevrolet, 4. Frank Kimmel (Clarksville, IN) Toyota, 5. Will Kimmel (Sellersburg, IN) Ford, 6. Kelly Kovski (Springfield) Chevrolet, 7. Justin Boston (Baltimore) Toyota, 8. Ken Schrader (Fenton, MO) Chevrolet, 9. Shane Cockrum (Benton) Ford, 10. Austin Wayne Self (Austin, TX) Dodge, 11. Tom Hessert (Cherry Hill, NJ) Dodge, 12. Ryan Unzicker (El Paso) Chevrolet, 13. AJ Fike (Galesburg) Ford, 14. James Swanson (Clarksboro, NJ) Dodge, 15. Thomas Praytor (Mobile AL) Ford, 16. Roger Carter (Sunfield MI) Dodge, 17. Mark Littleton (Arenzville) Chevrolet, 18. Dale Shearer (Alhambra) Ford, 19. Ron Cox (Soddy Daisy TN) Chevrolet, 20. Brad Smith (Shelby Twn. MI) 21. Brian Finney (Merritt Island FL) Chevrolet, 22. Ray Ciccarelli (Elliott City MD) Dodge), 23. Brennan Poole (The Woodlands TX) Toyota, 24. Brad Dubil (Bettendorf IA) Dodge, 25. Wayne Paterson (Pulaski TN) Ford, 26. Chris Bailey (South Park PA) Ford, 27. Brent Cross (Cortland NY) Chevrolet, 28. Bob Strait (Manteno) Chevrolet, 29. Karl Weber (Ambia IN) Chevrolet, 30. Dale Matchett (Cherry Hill NJ) Chevrolet.